Anybody who regularly visits a coffee shop or enjoys baking can tell you how great it is to take a big bite out of a fresh muffin, especially if it’s something sweet that you don’t get to try every day of the week. 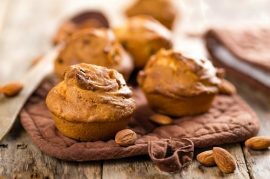 If you also enjoy a filling of Manuka honey, then you’re in luck, because these muffins are chock-full of the stuff, and they are worth taking the time to make yourself. Start by pre-heating your oven to 400 degrees Fahrenheit on the Bake setting. Using a large-sized bowl, mix together the sugar, the flour, the salt, and the baking powder. In a smaller bowl, mix together the evaporated milk, the egg, the melted butter, and a 1/4 cup of Manuka honey. Pour the contents of this bowl in with the dry ingredients and stir until just moistened. Fill paper-lined or greased muffin cups about three-quarters of the way full. Bake the muffins between 15 and 18 minutes or till a toothpick or fork inserted into the center comes up clean and without residue. Avoid over-browning the muffins. Allow about five minutes for the muffins to cool, and then remove them from the pan and onto a wire rack. Before serving, drizzle more Manuka honey over the top of the warm muffins. You should have about 12 to 14 muffins, which should freeze well once they have cooled and can be sealed in sizable freezer bags for up to three months. You can also serve the muffins immediately and store them in an airtight container at room temperature for up to two weeks. Need to order some Manuka honey so you can make this recipe? To get your order started, click here. And, remember, we offer FREE shipping on all orders of $150 or more!